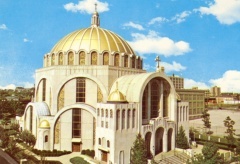 Located in the historic Northern Liberties district in Philadelphia, Pennsylvania was erected in 1966 through the effort of Ukrainian Catholics in America. This magnificent edifice, designed by Julian K. Jastremsky, replaced the old Cathedral Church which had been purchased in 1907 by Bishop Sotor Stephen Ortynsky, O.S.B.M., the first bishop of Ukrainian Catholics. The present Cathedral, constructed to reflect authentic Byzantine architecture, is built in the same style as Hagia Sofia (St. Sophia) Cathedral in Constantinople (present day Istanbul, Turkey). It also mirrors the beauty and richness of the religious and cultural heritage of the Ukrainian people. Basic geometric forms were purposely and consistently used to develop the character of the building. Almost no ornamentation is needed, though the completion of the interior embellishments is an ongoing process which will continue over the years. The limestone and architectural concrete structure is 172 feet in length, 128 feet wide, and 106 feet high. The most impressive feature of the Cathedral is the central dome, which is 100 feet in diameter. It's exterior is covered with 1/4 inch square Venetian glass tiles made of 22 karat gold fused in glass. The dome's interior portrays a mosaic of the Pantocrator (Christ, the Almighty ruler). The dome seemingly rests on 32 windows, depicting the coat of arms of regions of Ukraine, and the popes, bishops and religious orders who contributed to the growth of the Ukrainian Catholic church in the United States. The zig-zag design seen in the windows above the arches is a wheat motif. 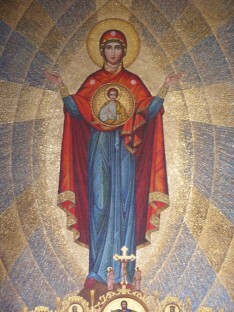 The great mosaic on the sanctuary wall honors the patroness of the Cathedral, the Theotokos (Birth-Giver of God). Below the mosaic of the Mother of God is a mosaic of the Last Supper. 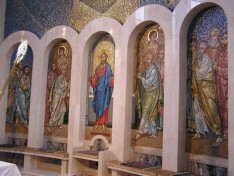 To the right, is a mosaic of Emmaus (Christ meeting the two disciples on the road to Emmaus. The disciples recognized Our Lord by the "breaking of the bread". To the left of the Last Supper mosaic, where the Preparatory table is placed, is a mosaic of the Visitation of the Holy Trinity (three angels sharing a meal) from the Old Testament. The sanctuary windows depict 12 angels, each with six wings as described in the prophetic vision of Isaiah. 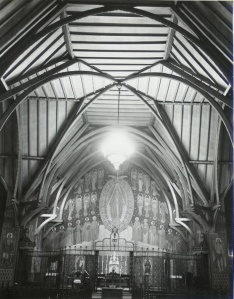 The Iconostas (icon screen), which separates the sanctuary from the Nave (body of the church) was designed by Chrystyna Dochwat. In the middle of the iconostas are the Royal Doors on which there is an icon of the Annunciation (Archangel Gabriel bearing the Good News that Mary would become Mother of God). Below this, are the icons of the four Evangelists (Gospel writers): St. Matthew (top left), St. Mark (bottom left), St. Luke (top right) and St. John (bottom right). The smaller doors on the Iconostas are called the Deacon Doors. To the right of the Royal Doors you see following Icons: Christ the Teacher, St. Stephen the First-Martyr (on the deacon door), and St. John the Baptist. To the left of the Royal Doors, you see the following icons: Mother of God with the infant Jesus, St. Michael the Archangel (on the deacon door), and St. Nicholas the Wonderworker. Immediately above the Royal Doors is the icon of the Last Supper. At the very top center of the Iconostas a depiction of the crucifixion with the beloved disciple John and Mary the Mother of God present. Below that is the icon of Christ the King. The crypt (housed under the Sanctuary of the Cathedral) contains the earthly remains of three bishops: Bishop Soter Stephen Ortynsky, OSBM (+March 24, 1916), Metropolitan-Archbishop Constantine Bohachevsky (+January 6, 1961) and Metropolitan-Archbishop Ambrose Senyshyn, OSBM (+September 11, 1976). When the Cathedral cornerstone was laid on October 16, 1966, a stone from the tomb of St. Peter the Apostle was placed therein. This stone was given to Archbishop Ambrose Senyshyn by Pope Paul VI for the Cathedral as a fitting symbol of the unity of faith of the Ukrainian people with the Apostolic Roman See. This unity of faith is all the more apparent in the honor accorded Ukrainian Catholics by the visit of the Supreme Pontiff, His Holiness John Paul II to this, our Ukrainian Catholic Cathedral in Philadelphia on Thursday, October 4, 1979. The Sixth Archbishop of The Ukrainian Catholic Archeparchy of Philadelphia for Ukrainians and Metropolitan of the Ukrainian Catholic Church in the United States of America is The Most Reverend Stefan Soroka. He was enthroned on February 27, 2001, succeeding Most Reverend Stephen Sulyk, Archbishop Emeritus. Nave, front to back, not including sanctuary_______________90 ft.
Nave, across middle of church________________________104 ft.
Senctuary________________________________________42 ft. by 42 ft. Height of dome, floor to mosaic_______________________106 ft.